I think each case of that question deserve their own question. What was Hofni and Phineas apparent sin? Did they sin? What did they do? I am not a rabbi nor will I ever be. So what does the law actually said? Judaica Press Samuel I 2:22 cites Rashi who quotes the gemoro that Rabbi Shmuel Bar Nachmani said in the name of Rebi that by delaying the sacrifices of the women who were bringing sacrifices, it was as if they had committed adultery with them. Actually they delayed the women from returning to their husbands. This was an abuse of authority rather than the actual sin of which they were accused. Similarly in 2:17-22 it was not theft because they were supposed to get the sacrificial meat, but it was an abuse of authority by taking it when it was more convenient for them (and delaying the actual kaparah) rather than the normal time to do so. 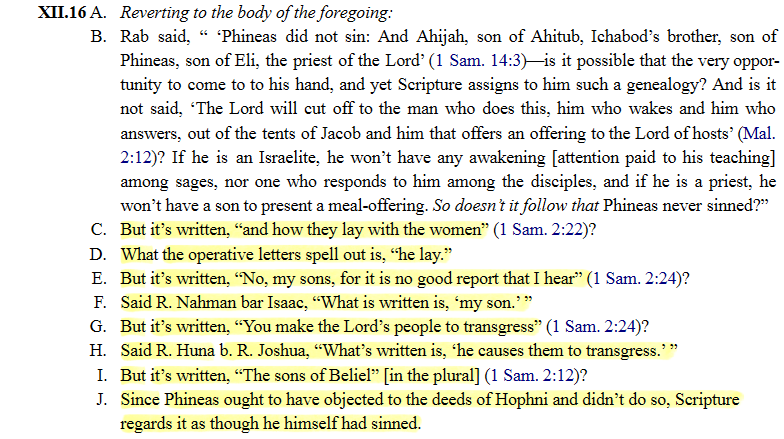 The Babylonian Talmud (Shabbath, Folio 55B) is clear that Hophni (or Chofni) was engaging in open sexual immorality. However, his fellow priest and brother, Phineas (or Pinchas) had tolerated the immoral behavior, for which he too was deemed culpable by reason of association in the high priestly office. Not the answer you're looking for? Browse other questions tagged sin samuel-shmuel-book-of .